Miss Patisserie: Kid-approved cookies ... for a cause! Kid-approved cookies ... for a cause! Kids love cookies! Even better when they benefit childhood cancer research! Do you need an excuse to eat a few cookies? Are you looking for a way to do a good deed today? Look no further: Purchase cookies from Cookies for Kids' Cancer and 100% of the profits will be donated to benefit childhood cancer research. Your purchase is tax deductible and you will receive a beautiful box of gold-star sugar cookies. I ordered a package myself and can attest that the cookies are delicious! - One in 300 children will be diagnosed with cancer by the time they're 20 years old. - Less than 4% of the National Cancer Institute's budget goes towards pediatric cancers. - Pediatric cancer is the #1 killer of children in the United States. 1.) Go here to purchase a gift box of 18 cookies (all profits benefit Cookies for Kids' Cancer). 2.) Order by September 30th in order for proceeds to fund the cause. 3.) Be generous! The cookies also make a thoughtful gift for family and friends! You'll receive this gift box filled with 18 star-shaped sugar cookies. "In honor of the tens of thousands of children in the U.S. who are battling cancer, we have created a special limited edition star-shaped cookie for the month of September, Childhood Cancer Awareness Month. 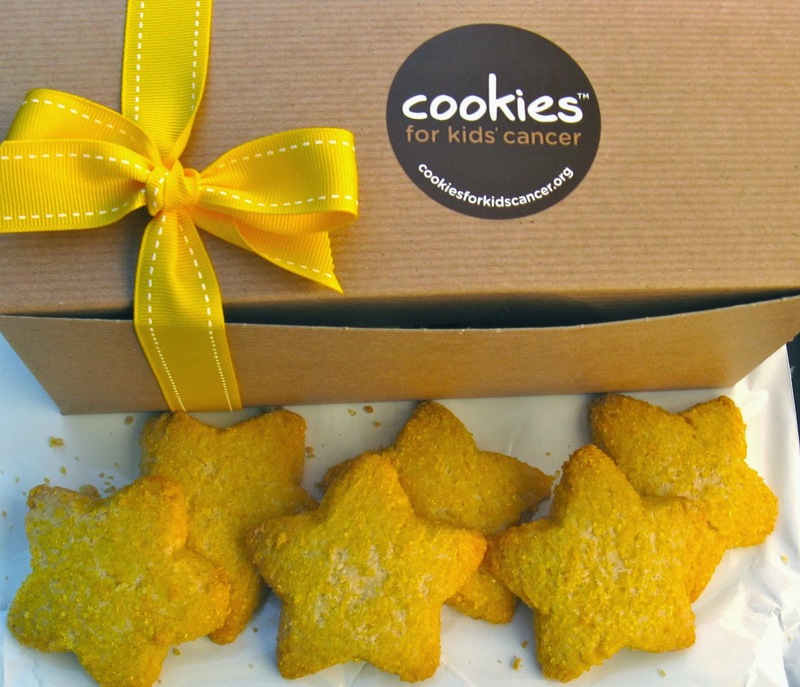 Gold is the color of childhood cancer awareness, and the children who inspire us to fight also inspired the cookie’s shape, as they truly are shining stars." Cookies for Kids' Cancer is a 501(c)3 non-profit foundation dedicated to raising funds for pediatric cancer research by providing support & resources for individuals & businesses to host fundraising events. You get a gold star for supporting this cause! You can also support the cause by ordering one of the cookbooks shown below. 100% of author proceeds from book sales are donated to Cookies for Kids' Cancer for pediatric cancer research. "All the Good Cookies" offers an extensive repertoire of over 65 cookie recipes. The cookbook also includes tips and inspiring kids' stories from the Good Cookies program. Order "All the Good Cookies" to benefit the cause. The "Best Bake Sale Cookbook" teaches you how to host your own bake sale with easy recipes for cookies, brownies, cupcakes and more. Order "Best Bake Sale Cookbook" to benefit the cause. You had me at 'Kid Approved' and 'For a Cause' but then I saw the pictures and I know there is no turning back. I can't wait to do good. Looks delicious!